Fall has always been my favorite season. As a child, it represented a steady string of family birthday celebrations, pumpkin carving, and mascarading. Adding to that now is the seasonal song of the migrating sandhill cranes, the golden leaves of the majestic Cottonwood fluttering wildly to the ground, and the underground migration of Yerba Mansa medicine. That is, the movement of the plant’s energy into the roots, creating a potent healing ally. The striking beauty of Yerba Mansa stands out in a hot desert valley. In the light of the setting sun the white petal-like sepals of Yerba Mansa radiate an iridescent glow that reflects an otherworldly palate of colors. If conditions permit, it will spread and create a large stand of plants connected by surface runners each rooting at the nodes of growth. It is these highly aromatic rhizomes and roots that make the potent medicine of Yerba Mansa. To expose and harvest the roots is a labor of love, enacted with a grateful heart. It is a careful excavation done with patience and acceptance of the damp clay-like soil that tenaciously enshrouds the roots. As the process unfolds the prizes are plentiful: a day in which the boundary distinguishing myself from the land is blurred and a return to awareness of my interbeing with roots, trees, the sky, and beyond. In addition to these invaluable rewards, is the medicine to be made. Yerba Mansa is prized for its multitude of herbal actions and applications. It is anti-inflammatory, broadly anti-microbial, astringent, anti-catarrhal, and tonifying to the mucous membranes with an affinity for the digestive, respiratory, and urinary systems. 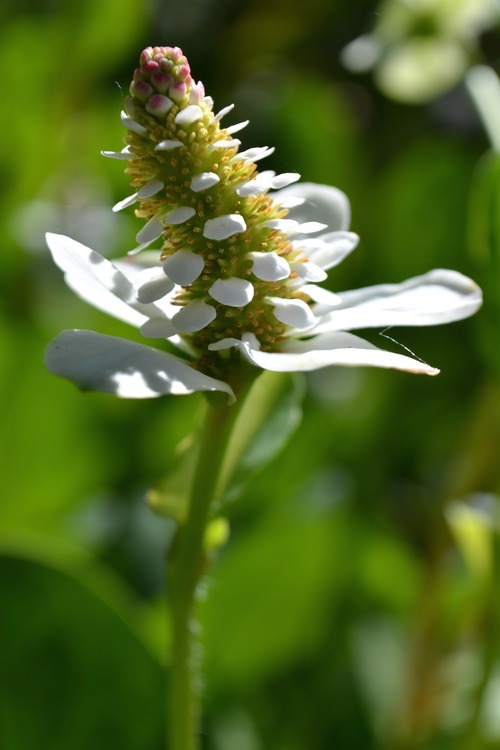 Yerba Mansa operates the same way whether in its native habitat or the wilderness of our bodies by regulating the flow of fluids to move and cleanse stagnant waters and toxins. It also fortifies the membranous organs of the environment with astringing powers, antiseptic aromatics, and warming stimulation that invigorates the vitality of any place it happens to be. It is these qualities that have made Yerba Mansa the legendary folk remedy it is and give it an eternal place in my backyard garden and medicine cabinet. I prepare the rhizomes and roots as both tea and tincture for use in a variety of formulas created for chronic inflammatory conditions, digestive disorders, skin issues, urinary infections, mucous-producing colds and sore throats, hemorrhoids, oral healthcare, athletes foot, and many other situations. I love the aromatic earthy decoction as my favorite form of medicine, but also regularly use the freshly dried root (they should still look reddish rather than brown and have a powerful aroma) tincture prepared with 60 to 75% alcohol. The leaves have mild medicinal properties which I mainly use as a poulticing herb for skin inflammations and mulch in my garden. Here in the Rio Grande Valley, Yerba Mansa finds its place amongst the Cottonwoods and Willows in the riparian ecosystem known as the Bosque. This is also my home, right in the Rio Grande floodplain. The Bosque was once a wild and changing environment as the landforms and forests shifted with the meander of the river. During the last century, however, extensive flood control measures and water diversion projects have changed the landscape in new and different ways. The river is entrenched and dammed while surface flows and ground water levels are significantly diminished. This has resulted in a massive increase in non-native trees and plants that outcompete natives in many areas of the Bosque. Given these ecological considerations, I strongly encourage the cultivation of this beautiful and easy to grow plant. Additionally much of Yerba Mansa’s habitat is protected public land with regulations against harvesting plants. Please respect these laws designed to create space for all wildlife to simply exist. Call to Action: Yerba Mansa has much to teach us about our relationship to plants and to wild places. Many of our treasured wild herbs are facing tough times from habitat loss, competition with invasive species, overharvesting, and other threats. Don’t just sit there ~ do something. Engage in restoration activities in your area. Join The Yerba Mansa Project or find some way to give back where you live. Educate yourself on ecological issues in your bioregion and adjust your own practice accordingly. It is our personal responsibility to make herbalism sustainable. Grow endangered herbs or plants facing wild habitat loss in your own garden. Buy Yerba Mansa plants from a local nursery like Plants of the Southwest here in New Mexico or order some from Horizon Herbs. Purchase Yerba Mansa roots from a cultivated sustainable source such as New Mexico Farmacy. Learn to use weeds, common wild plants, and cultivated garden herbs as the foundation of your practice. Using the commonest plants around you takes the pressure off of wild populations of less common plants or those in greater demand. Join or donate to United Plant Savers and be part of the movement to protect wild healing herbs and their habitats. This entry was posted in Bosque, herbal medicine, herbalism, herbs, native plants, yerba mansa and tagged Bosque, herbal remedies, herbalism, restoration, Rio Grande, yerba del manso, yerba mansa on November 11, 2014 by darasaville.